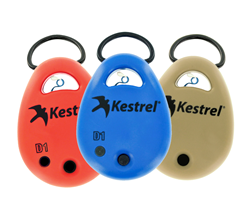 The Kestrel DROP is a wireless environmental data logger that measures temperature, humidity and barometric pressure (model dependent), and connects wirelessly to the Kestrel Connect App to view logged data on smart devices. Nielsen-Kellerman (NK), manufacturer of the Kestrel® Weather & Environmental Meters, a brand trusted by users for more than a decade, announced the upcoming release of the Kestrel DROP® Wirelesss Environmental Data Loggers, which connect via Bluetooth® Smart to a user’s iPhone, iPod or iPad (generation compatible), to view, log and chart captured environmental data. Users can download the Kestrel Connect App directly from the App store. “We are excited to add this product line to the rugged and field-proven Kestrel line. The applications are really endless. From measuring environmental data during cargo transport to conditions in the field for military training to feeling secure about the climate conditions in any room in your home or office building, we want to make sure you’re able to measure all of these conditions even when you’re physically not there,” said NK CEO Alix James. Built to Kestrel’s brand-specific rugged durability standard, the Kestrel DROPs are waterproof (IP67 standard) and drop-tested to MIL-STD-810G. Users are also able to set threshold alarms where an in-app pop-up will notify a user in range that certain measurement criteria have been met. Visit http://www.nkhome.com/kestrel/drop frequently for product updates and launch dates. The Kestrel line of products that monitor, record and log weather & environmental data, enable users to “know their conditions” is manufactured by NK, which has been building technically advanced environmental instruments for more than 15 years. Kestrel products are employed by thousands of users to keep them safe and informed as they work and play. Each Kestrel branded product is patented, rugged, accurate, waterproof, easy-to-use and backed by an industry-leading five-year warranty. Available measurements include wind speed, air flow, temperature, humidity, wind chill, heat stress index, pressure, altitude, wind direction, air density and wet bulb temperature. Advanced models include the Kestrel 4000 series weather & environmental meters which add high-capacity data-logging with on-screen graphical recall and optional Bluetooth® wireless data transfer to computers and smart phones as well as specialized features such as a ballistics calculator for long-range shooting and an evaporation rate calculator for concrete placement. Every NK product is designed, developed, built, tested and supported entirely in the USA. NK is proud to be both a recognized leader in lean manufacturing and process improvement and an award-winning top workplace.